C1624. 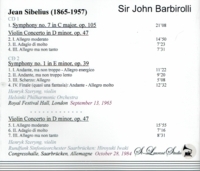 SIR JOHN BARBIROLLI Cond. Helsinki Phil. 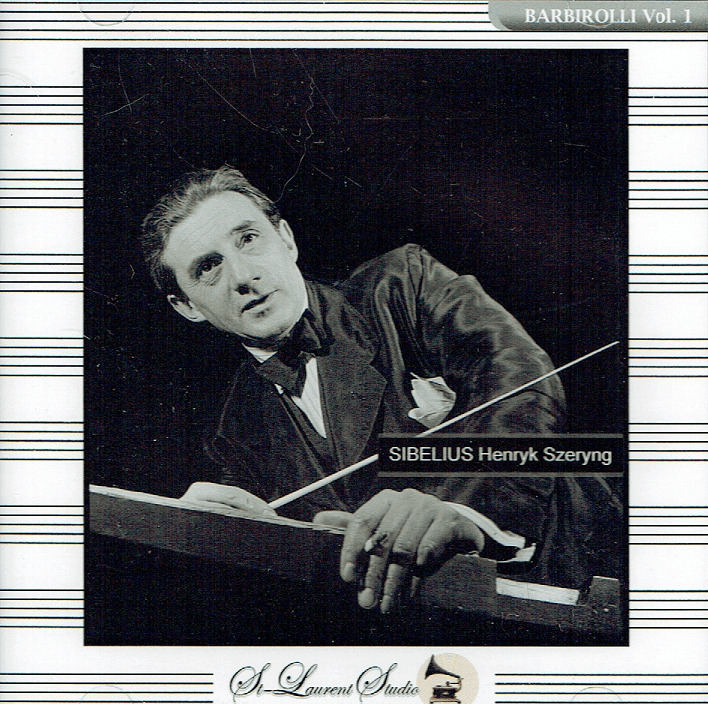 : Symphony #7 in C; Symphony #1 in e; w.HENRYK SZERYNG: Violin Concerto in d - Live Performance, 13 Sept., 1965, Royal Festival Hall, London; SIR JOHN BARBIROLLI Cond. Saarbrücken Rundfunk S.O., w.HENRYK SZERYNG: Violin Concerto in d - Live Performance, 28 Oct., 1984, Saarbrücken (all Sibelius). (Canada) 2-St Laurent Studio YSL T-656. Transfers by Yves St Laurent. "Henryk Szeryng, one of the more elegant representatives of a now fading school of Romantic violin playing, was known for the purity of his playing - exact intonation, well-organized phrasing and a broad, sweet, vibrato-filled tone that nevertheless did not sound oppressive. In the Romantic tradition, Mr. Szeryng applied his long, lyrical style to Mozart, Bach and Vivaldi as well as to Brahms and Tchaikovsky. The various schools of interpretation, in other words, were filtered through the single 19th-century Central European tradition that was his heritage. Among his teachers were Carl Flesch in Berlin and Jacques Thibaud and Nadia Boulanger in Paris. 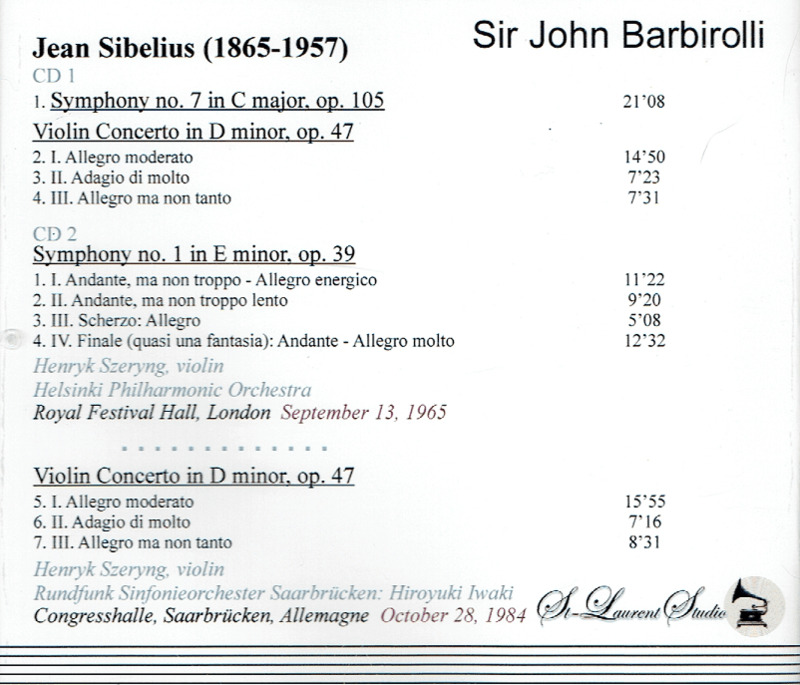 Mr. Szeryng began his concert career in 1933 and spent World War II as liaison officer to the exiled Polish Premier. His musical life continued its close contact with politics and diplomacy when the Mexican Government invited him in 1943 to teach at the National University in Mexico City. He became a Mexican citizen and later traveled on a diplomatic passport as the country's Culture and Good Will Ambassador. After 10 relatively quiet years of teaching and occasional concerts, Mr. Szeryng met Arthur Rubinstein after a recital in Mexico City. With the help of his fellow pianist and Polish compatriot, Mr. Szerying developed an international career that was still flourishing at his death. While retaining his home and teaching responsibilities in Mexico City, he also kept apartments in Paris and Monte Carlo. Mr. Szeryng also became a busy recording artist, with a discography of about 250 works. Mr. Szeryng's tastes ran to the standard literature. He was especially fond of Paganini, yet 20th-century composers like Carlos Chavez, Benjamin Lees and Michael Ponce wrote music for him. Mr. Szeryng also liked to play music by the contemporary Polish composer Karol Szymanowski. He exercised his diplomatic responsibilities in part by championing the music of Mexican composers, and he expressed his belief in the humanistic powers of music as an adviser to Unesco. He was also said to donate large portions of his income to charities. From Mr. Szeryng's collection of violins, 12 have been given away since 1975 - one a Stradivarius presented to the city of Jerusalem, another a gift to the young violinist Shlomo Mintz. Mr. Szeryng retained for himself the 1743 Guarnerius named 'Le Duc'."